The downed tree impacting Gold Line service. Photo: Metro. 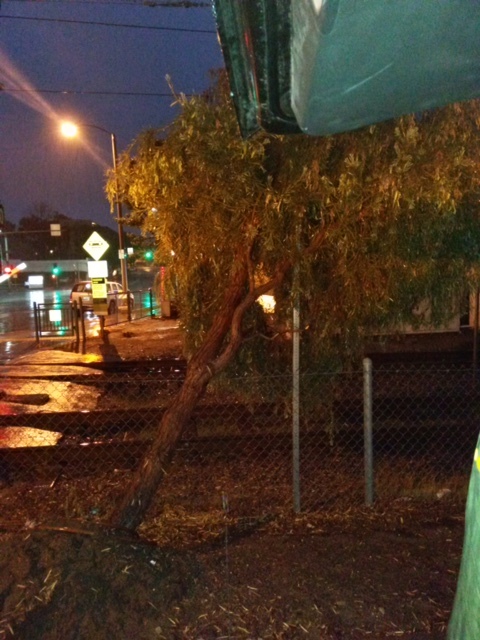 Expect significant delays on the Gold Line due to a downed tree near Del Mar Station in Pasadena. Trains are sharing the outbound track between Del Mar Station and Lake Avenue Station. Please allow extra time for your commute no matter how you’re traveling this morning — bus, train, driving. It’s going to be a messy, wet commute. And please walk — don’t run — near Metro buses and Metro Rail due to slippery conditions. Receive frequent service updates by following Metro on Twitter. Service updates are also posted to the metro.net homepage and, of course, appear in the righthand column of this blog. Delayed by Metro Rail this morning and need delay verification for work or school, please call Customer Relations at 213.922.6235 or fax them at 213.922.6988.